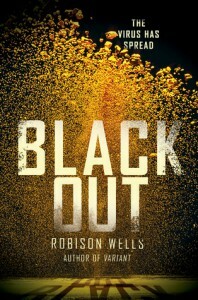 Nose Graze — Young Adult book reviewsBlackout started out incredibly strong! I loved the characters, the mystery, and the suspense. I was completely hooked and breezed right through the first half or so.This book felt very X-Men-esque. People start developing powers, but there are so many people who aren't aware of their powers, or are even afraid of them. Aubrey has the power to disappear. She has no idea where it came from or whether or not something is 'wrong' with her; all she knows is that she can do it.I really liked Audrey as a character, mainly because she was flawed. At the beginning, Audrey isn't the best person. She kind of ditched her old friends in order to climb the social ladder in high school, and she now uses her powers of invisibility to shoplift (because she's really poor, so she uses it to steal school supplies, medicine, etc.). But by the end of the book, I think Audrey really changes and turns into a better person, and I love that! She really cares about doing the right thing.Jack is also a great character. He's just a regular guy, but he's such a sweetheart! He's just one of those guys who is genuinely really, really nice. A small romance does develop between Audrey and Jack, but it was far from the center of the story. I honestly wasn't completely sold on the romance, just because there wasn't that much chemistry between Jack and Audrey, but since it was more of a minor subplot than anything else, I wasn't too bothered by it.The big bummer for me was how long we had to wait to get any answers, and even then we only got a tiny snippet. Throughout the entire book we know there are terrorists, we know the damage they're doing, we even know who some of them are, but we have no idea what their motives are or who/what they represent. We're strung along for the entire book and then we're thrown half a bone. Because it took so darn long to get any shred of information, my interest did start to wane towards the end.But despite that, I still enjoyed the book. It was really interesting, I was loving the X-Men feel to it, and I feel like the series is headed in a great direction! There was sort of a mini bomb dropped at the end, and I'm really curious to see how it develops in the second book!